Increase Testosterone Exercise with High Intensity! Increase testosterone! Exercise with High Intensity! High intensity exercises are so good at reducing fat, building muscle, and increasing testosterone levels, that every male on planet earth should be doing them. In a nut shell to exercise using HIT, you need to..
You should do your routines 2 or 3 times a week, max! Anymore than that and you'll increase your cortisol levels, which will cause your testosterone levels to decline. The key this entire program is to work out at maximum intensity, infrequently! 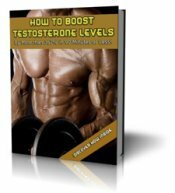 Testosterone Levels Exercise and Muscle Mass! There is an extensive body of scientific evidence that indicates that interval-type training is much more effective than low intensity exercise at improving health and fitness. A 1998 study showed that HIT interval training quickly increased muscle oxidative capacity to an extent normally associated with traditional endurance training. Our data are consistent with other high-intensity, short-duration exercise training studies (MacDougall et al., 1998) and indicate that this type of training is effective for rapidly improving muscle health. In 1995, another showed that people who exercise less frequently at high intensity, are much more likely to stick to their fitness program than those who exercise at lower intensity for longer periods of time. According to Martin Gibala an exercise and fitness researcher out of McMaster University..
Short bouts of very intense exercise improved muscle health and performance comparable to several weeks of traditional endurance training. HIIT is much more effective than long, slow, boring anaerobic workouts, at building muscle, and burning fat. Based on the research, you're much more likely to stick with it over the long haul.